The Celts called the Idarwald mountain range "Id-ar", which basically means "forested heights above the country". This name seems quite appropriate for the completely forested knoll of Idarkopf (746m) and for the highest point "An den zwei Steinen" (766m). The Idarkopf, which is covered with a whole string of archaeological finds, is also said to be the "sacred mountain" of the Celtic tribe of Treverians, who were resident here during the Latène Age (500-20 B.C.). A notable find in the neighbouring forested area are the remains of pre-Christian temples, one of which is a Sirona sanctuary, where a well preserved statue of the Celtic goddess Sirona has been found. Sirona was regarded as the goddess of healing springs and of the heavenly stars and was also known by the name Dirona (=star). The area around Idarkopf was definitely settled in pre-Celtic times, as evidenced by the nearby Menhirs (upright standing stones) from the Stone Age and Bronze Age. Among these Menhirs is the prehistoric "King's Stone" at the western end of Rhaunen, directly on the road to Stipshausen. Its origin and significance are, however, obscure. The very long history of settlement in Rhaunen is probably explained by the fact that this location at the foot of Idarkopf is climatically well protected, lying in the shallow valley basin of Idarbach creek. No fewer than seven small streams merge here. 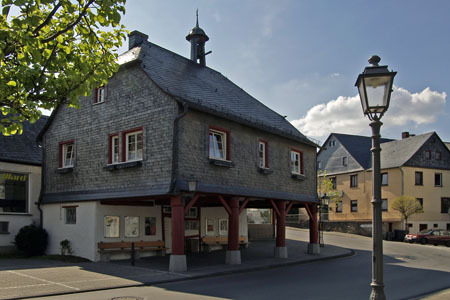 In the Middle Ages Rhaunen acted as a small economic centre for the surrounding community and, at the same time, a "Dingstätte" (place of assembly) was established where the high court for this region convened. The jewel of this town is the old city hall, built in 1723. The upper floor is supported by four massive oak columns and entirely faced with slate. This quite unusual construction creates an open entrance hall onto the street. The centre of Rhaunen is dominated by a church with a Romanesque steeple with a square base from the 12th century, whose helmet-roof with four small corner turrets is from an even earlier date. Inside the church is the earliest organ (1723) made by Johann Michael Stumm (1683-1747), an organ builder who was famous far beyond his immediate area neighbouring Sulzbach, who established a very successful dynasty of organ builders lasting many generations. Another diversion worth making is to nearby Bundenbach with the reconstructed Celtic Altburg Fortress, which was built between the 3rd and 1st centuries B.C. and, until the Roman conquest, served as a local centre for the inhabitants. During archaeological investigations 35 years ago they were not only able to ascertain the construction of the fortifications, but also drew up a complete plan for the interior of this Celtic fortress. On the basis of these finds today you can view five reconstructed residential buildings and five reconstructed granaries on stilts. Not far from here lies the Herrenberg slate quarry with its rich collection of fossils in Hunsrück slate from the Devonian Period, 350 to 405 million years ago. In the stone slabs of this quarry are the world-famous fossils of Bundenbach Slate, including sea lilies, starfish and jellyfish, whose soft parts have partially been preserved in fossilized form. Collectively, more than 60 different varieties of plant life and 240 different kinds of animal life from the Devonian Period have been discovered here.